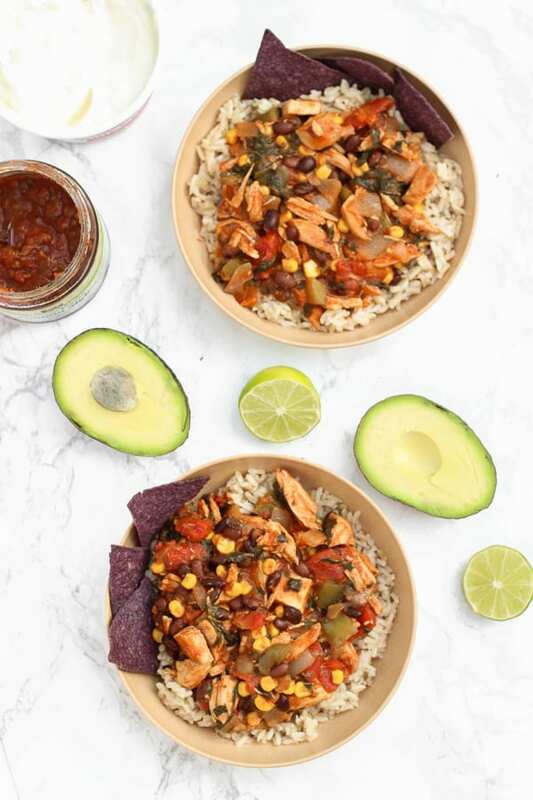 These chicken & veggie enchilada bowls are easy to customize with your favorite veggies & they’re super simple to make! After my sister’s wedding a couple of weekends ago, we had so much leftover food. For a couple of days after the wedding, we still had relatives in town so they helped finish off snacks and desserts like the entire bottom layer of the wedding cake, the giant bags of popcorn from the popcorn bar, some of the fruit (I was in fruit heaven with the eight or so quarts of strawberries we had left), and a bunch of other random leftovers. We also had leftovers from the main meal. We actually had a whole pan of chicken from a sustainable, farm-to-table catering place, so it was super quality meat that I wanted to put to good use! 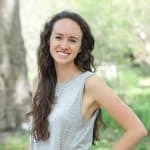 I’ve always hated wasting food but since I started grocery shopping for myself several years ago, I’ve become even more conscious about food away since I realize how much everything costs! One recipe I ended up making was these chicken & veggie enchilada bowls. Having pre-cooked chicken already in the fridge made this meal so quick to put together. When I make this again in the future, I’ll probably use a rotisserie chicken to save time. Since, you know, I don’t normally have an entire pan of the fully-cooked chicken ready to go. Why enchilada bowls instead of regular enchiladas? Well, there’s definitely room for both recipes in my life! I happen to love regular enchiladas. 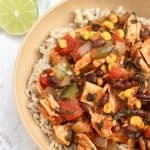 But the great thing about these chicken & veggie enchilada bowls are that they’re more adaptable for a variety of different diets. My mom is currently eating grain-free, so these bowls were awesome because my dad and I could eat them with rice and my mom could have hers with a side of steamed veggies. 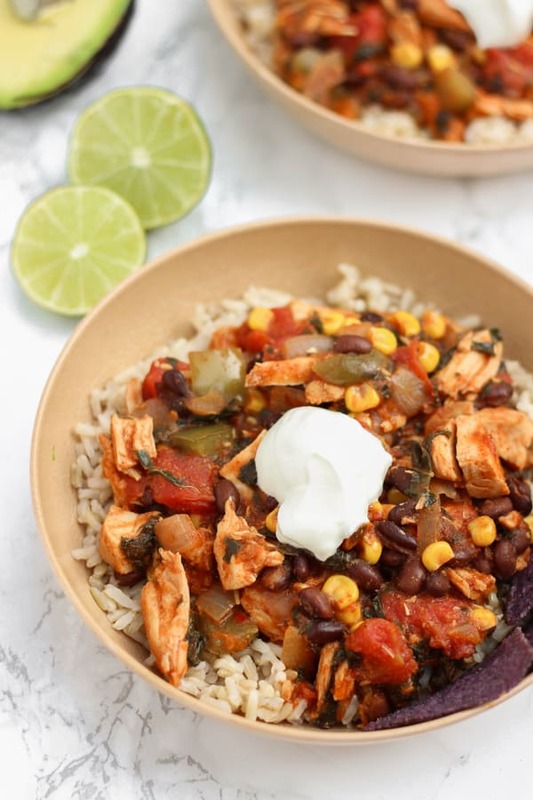 You could also serve the chicken enchilada mixture over a baked sweet potato or alongside roasted sweet potato wedges– I think that would be amazing! Or over quinoa, or even a bed of spinach for a lighter option. 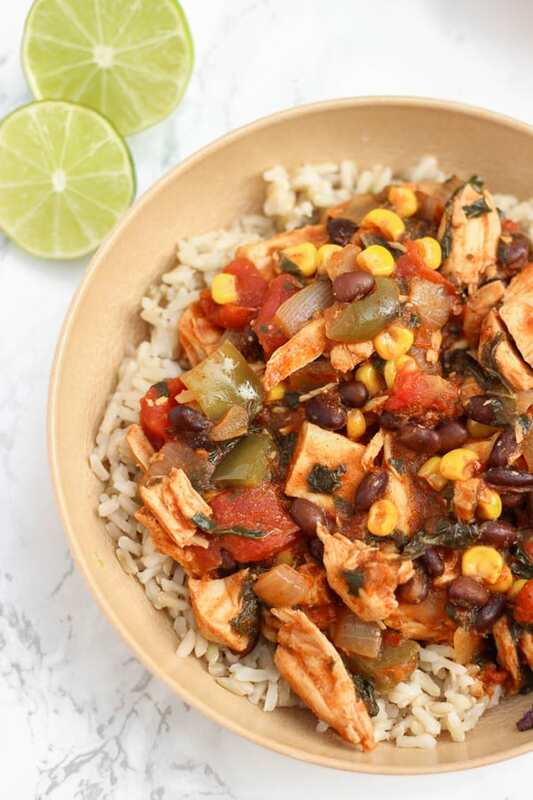 These bowls are also a lot quicker to whip up than traditional enchiladas since it’s basically just adding a bunch of enchilada mix-ins to the cooked chicken, so there are no tortillas to stuff and no oven time. If you go the rotisserie chicken route, you can throw them together in about 20 minutes. If you don’t already have cooked chicken on hand, I like using Mel’s super easy method for cooking plain shredded chicken. Like a lot of my recipes, this is a basic framework that’s easily customizable for your tastes. You can leave out the kale or substitute spinach, or add in extra veggies. Zucchini or mushrooms would be great! And make sure you load these up with toppings– sour cream, fresh guacamole, and/or a sprinkle of cheese take these over the top. A note on enchilada sauces: A bunch of brands have MSG, but the Whole Foods and Trader Joe’s brand enchilada sauces are good bets to avoid that stuff. 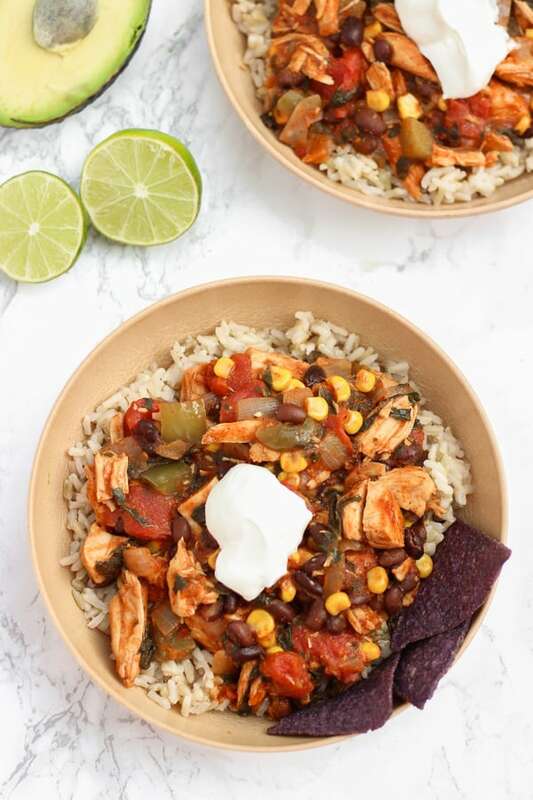 If you try out these chicken & veggie enchilada bowls, feel free to let me know in a comment or take a picture and tag me @livbane on Instagram. Hope you enjoy! Start cooking brown rice or other grain, if using. Cook according to package directions. In a large saucepan or skillet, sauté onion and bell pepper over medium-low heat for 5-7 minute until soft (and any other veggies you'd like to add). Add taco seasoning, enchilada sauce, diced tomatoes, black beans, corn, chicken, and chopped kale. Heat mixture on medium or medium-low until it's warmed through and kale has wilted, for 10 more minutes. Serve over brown rice, quinoa, or sweet potatoes. I am so glad you were creative in using all the chicken left from the wedding. Yes! Can’t let anything go to waste! Since I cook dinners almost every night for my boyfriend and I this is a great way to repurpose leftover chicken into a new meal for the next night! Yay, I hope you two love these! Food leftovers are the best. It’s simply give us the opportunity to create recipe that your family would enjoy. I know some people aren’t a fan but I seriously love leftovers. I think some things, like lasagna, are even better as leftovers! You’ll have to give them a try! So simple and SO good! Liv this bowl looks amazing! What a great way to use up the leftover chicken. I just love bowl food… so nourishing and delicious. Also, I need to get better at not wasting food. I’ll be moving out this fall and have to start buying my groceries, so I’m hoping I can get better at it! Have a great week! I just got these new wide, shallow pasta bowls and I can’t wait to serve all kinds of delicious bowl combos in them! Hope you have a great week, too!